Are you a home or business owner in Dorset? Do you require a specialist exterior clean where the DIY approach simply will not do? 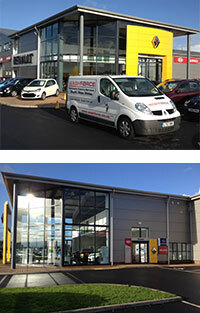 Help is close at hand with your local go-to exterior cleaning team in Washforce Dorset. Washforce Dorset team have much experience in providing a wide array of exterior cleaning service across Dorset; from specialist window cleaning, gutter clearing, driveway cleaning, wall pressure cleaning, graffiti removal, fascia and patio cleaning and much more. Call us today to learn more about the services Washforce Dorset can provide you. As part of the ESL Facilities group, Washforce Dorset offer specialist services under the mantra of providing a ‘smarter and greener clean’, meaning not only our services will exceed your expectations by using a unique approach towards our service, but also in the environmentally friendly products we use which often come to a fraction of the typical product cost, so you’ll save money and the environment! It is not a pretty sight as a business owner to see that the facilities in which you work in dirty and poorly kept, what is worse is that the current state of your facilities may be driving away potential customers and clients by allowing a poor first impression. Don’t let yourself and your business fall victim to a poor first impression, call today for a team of expertly trained and qualified exterior cleaning specialists are only too happy to provide any commercial exterior clean you require to a standard you will be proud to display to your clients, simply call 03335 670529 to see how Washforce Dorset can help you and your business. Looking for a reputable cleaner in the Dorset area who will be able to clear your patio, decking or exterior paving & drive. Look no further than Washforce Dorset, from exterior wash solutions to both residential customers and local businesses in the Dorset region. Equipped with high powered jet sprays, a comprehensive kitlist of cleaning equipment…and of course a whole lot of expertise, rely on Washforce to deliver the cleaning service your patio, decking or driveway deserves! Do you suspect your property may be suffering from clogged gutters? You wouldn’t be alone in your suspicions…With autumn leaves falling and excess rain, the autumn and winter months create the perfect conditions for blocking the gutters of Dorset homes. However ignore at your peril! As untreated gutters can often lead to untold consequences for your home…including drainage problems, indoor water leaks and even pest infestations! Looking for a decent window cleaner in Dorset? Choose wisely, as while many window cleaners will punt their trade at your door, it pays to select at technician who is trained and insured to clean your windows correctly. Fortunately, when contacting your local Washforce team, you can be guaranteed the service of a true professional, who is highly trained, insured and comes with the service promises you would expect from a highly respected national brand such as Washforce. Don’t neglect your conservatory this Christmas. You’d be surprised how much dirt can accumulate over the winter month, resulting in a dark and gloomy-glassed room that you’ll be loathed to greet guests in over the festive period Don't put up with a dirty conservatory. Call today for expert assistance in making that conservatory shine!